We know what the Whale is not (that is, he is not Allegory), but how do we learn what the Whale is? 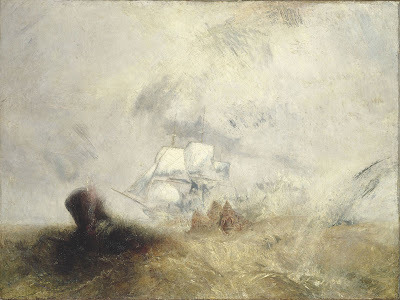 We have already discussed Ahab, and the way Melville uses every traditional literary technique, those found in Homer and Shakespeare and Milton and all the other books of the prior three thousand years and those to be developed over the coming hundred and fifty years, to build Ahab up as a grand tragic figure. Ahab is a dramatic figure, and Melville plays this up with stage direction and dialogue befitting a great tragic hero. 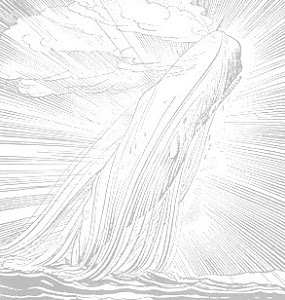 The Whale, however, is different; he is not built up as a grand hero through the usual literary techniques, and, in many ways, is the most creatively conceived character of the 19th century. How does Melville build up the Whale, and turn him into a grand heroic figure worthy of one of the two central places in this drama? Melville uses a mixture of fable and science; he simultaneously makes the Whale the object of constant study in all facets, using every tool of inspection, detection, induction, deduction, and reduction possible, from Cetological classification to Phrenological speculation to dissection to a thorough review of the literature and the artistic renderings (the rendering here, by the way, is "The Whale Ship" by Turner). He also provides any number of stories of direct interaction with whales and their carcasses, and gives us the whaler's own empirical evidence. The more I dive into this matter of whaling, and push my researches up to the very spring-head of it, so much the more am I impressed with its great honorableness and antiquity; and especially when I find so many great demi-gods and heroes, prophets of all sorts, who one way or other have shed distinction upon it, I am transported with the reflection that I myself belong, though but subordinately, to so emblazoned a fraternity. This approach requires considerable patience from the reader, a patience Melville eases with humor and the many interjected minor dramas, often from our savages or the mates. Still, the pacing is more comfortable to the readers of Eastern epics than Western novels; there is a Thousand-and-One-Nights or Journey To the Westintegration of disparate stories that here emcompasses quasi-factual as well as quasi-fictional passages. All of which adds to the exoticism that builds up the Whale as a character. As you read this book, don't ignore the dramatic tension being built around the Whale, a dramatic tension that is built far more subtlely and uniquely than that built around Ahab. It comes slowly, deliberately, and very, very oddly, but it does indeed come. How then do we know the Whale? Ultimately, we do not, we only learn of and never know of the Whale, and this incredible inscrutability of a grand but non-human character is what gains the Whale the role as title character, with a billing even above tragic Ahab. Ah, some expectations to live up to! I will do my best - thank you - we will enjoy this read!